Experience Single-Brand Simplicity with a Suburban SystemEdge package from OutBack Power. This package includes a factory pre-wired and tested SkyBox True Hybrid Energy System, EnergyCell batteries, battery rack or bank, SkyBox Rapid Shutdown, OPTICS RE web enabled monitoring and control and all necessary connection hardware. 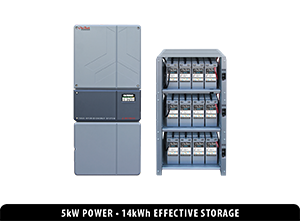 Featuring the 5kW SkyBox True Hybrid Energy System and twelve (12) EnergyCell 200NC batteries.